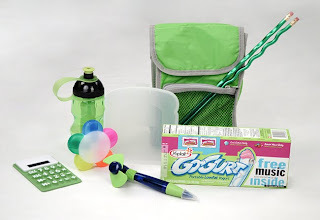 I was recently given the chance to do a product review & host a giveaway for Yoplait Go-Gurt Yogurt by Yoplait and My Blog Spark. They sent me a "Keeping Cool in School" Gift Pack To review. Today I would like to talk to you about a very cool product by Yoplait called Go-Gurt which is the first-ever portable yogurt in a squeeze tube for kids! This yogurt is perfect for on-the-go snacks and for packing in your child's lunch box for school. You can freeze the Go-Gurt in your freezer the night before, take it out and put into the lunch box the next morning. (There is no need to pack any type of ice packs). The Go-Gurt is designed to slowly thaw over time and be ready for eating come lunchtime! It will keep everything in your child's lunch box nice and cold. Cool Cotton Candy/Burstin' Melon Berry, Strawberry Splash/Berry Blue Blast, Rad Raspberry/Paradise Punch, Strawberry Banana Burst/Watermelon Meltdown, Strawberry Kiwi-Kick/Chill-Out Cherry, Ro-Gurt Special Edition Shaggy's Like Cool Punch & Rawberry and the SpongeBob Special Edition Strawberry Riptide & Bikini Bottom Berry. Kids and Adults both love the new Yoplait Go-Gurt! I recently used the Yoplait Go-Gurt in my granddaughters lunch for preschool. My granddaughter loves the smooth and creamy taste to it! In addition, the Yoplait Go-Gurt did stay cold until it was her lunch time! As a mother and grandmother, I feel good about packing healthy things in my granddaughter's lunch kit and Yoplait Go-Gurt is just the ticket because the easy to use portable tube contains a good source of calcium and vitamin D, providing a wholesome addition to a well-balanced lunch. You can find additional information about Yoplait Go-Gurt Yogurt on the Yoplait Web Site. they devour them ALL, though!! My granddaughter likes the SpongeBob Go-Gurt. We all agree on strawberry. I try to do all I can the night before. We love the strawberry flavor. I love putting little notes in the kids lunch box. Lunch packing tip - I usually freeze a drink and put it in box and it helps keep things cold and fresh! We like the Scooby Doo Ro Gurt variety pack the best but love 'em all. Fave lunch packing tip is pack it the night before. Few things are worse than being rushed in the AM. # 2 Fave lunch packing tip is pack it the night before. Few things are worse than being rushed in the AM. My daughter's favorite flavor is Banana Split/Strawberry Milkshake. Thanks! Strawberry Banana Burst/Watermelon Meltdown :) *Thanks* for the giveaway! My sons favorite flavor is cool cotton candy.